When we say the fastest way to learn, we mean it! Download: "Increase ROI with Performance Based Training" presented to the Society of Advanced Learning Technologies, Aug 2010, Washington DC, by Randy Hilgers, New Vision Software, Incorporated & Diane Tarkowski, DePaul University. resulting in an almost instant return on your training investment. Result: Buying SofTutor @ $399/per/person is actually cheaper than learning for free with another tool. If learning fast with higher retention, saving time and money is important then SofTutor is right for you! They say a picture is worth a 1000 words and if they're right then each SofTutor product is over 1,000,000 words. With SofTutor we'll show you how to design while you follow along with our veteran instructors each having over 15 years experience in CAD training. Click on tools, then click on rendering, then click on global lighting, then set the sun light to be high noon, the sun setting is above the spot light setting and to the right of the ambient lighting button.... Do you really want to spend hours looking for the spot to click on then wondering why your image does not look like the one in the book? Is it learning or is it lecture? Most video training is designed to be watched, remembered then try later, while this may be better than reading it still can be really boring and students have to rewatch over and over to get it down. Furthermore some teachers show you how to do something so fast that its almost impossible to impossible to learn from. Teachers like to talk and usually spend hours filling up time in their class talking with little learning time. SofTutor cuts through the lecture to give you 100% follow along learn by doing. We don't brag about our hours of playing time because do we really want to waste your time, no we want you to maximize your time. Who wants to spend 40 hrs learning when they can actually learn in 20 hrs. Our largest product is 6.7 hours, not 40 hours like others claim. Our goal is to train you, not to brag about how much we know. We don't want to fluff up stuff to to waste your time. Your are a professional, you should be spending your time drawing and designing not wasting your time watching someone go on an on about how to draw a line. Watch the SofTutor instructor and follow along in real time! No more trying to guess what the author was trying to say. one teacher, one student learning at your desktop. Dual monitor users Warning: SofTutor is designed to run on the same screen as the program your trying to learn. When you read your eyes move back and forth without turning your head and you don't even know your doing it. With dual screens you tend to move your head back and forth between screens, over time this method becomes very tiring. To get the most out of SofTutor, we recommend learning on the same screen as SofTutor. Mark Townsend at a Big Ten University said that his students learn more in 1/2 the time with SofTutor. He said that his students learn more in 20 hours than they used to learn in 40 hours. Mark also said that he saved 95% of his time using SofTutor. See Mark's quote. You'll start learning in minutes and should learn subject in about 2 times the number of hours on the SofTutor product. If you want to master a subject we recommend that you spend about 3 - 4 times the number of hours on the SofTutor product. I.E. If SofTutor for AutoCAD 3D is 6.6 hours, then you'll master AutoCAD 3D in less than 24 hours. That will give you about enough time to replay all sections two times and some sections 3 - 5 times to get the concepts down. Ideally you should play SofTutor and follow along once or twice to learn the concepts. In about 3 - 4 weeks you should repeat every step one more time to master the subject. How much will I save with SofTutor? If you consider that your time might be worth $15.00 an hour and if you could save 20 hours or more then SofTutor could save you over $300, probably more than the cost of SofTutor! How long would it take you to read a 500 page CAD book and learn everything covered? Compare your hours against our products! If you are an independent CAD professional you might consider taking a class at a local reseller or Junior College. Take the (cost of the class) x (hours of the class) and compare them against our products. If you have to travel to class and stay out of town then the savings could be even greater. The following table is provided as an estimate only. We will use SofTutor for AutoCAD 2000 as a base for the calculations and an hourly rate of $15 per hour or $30,000 per year. 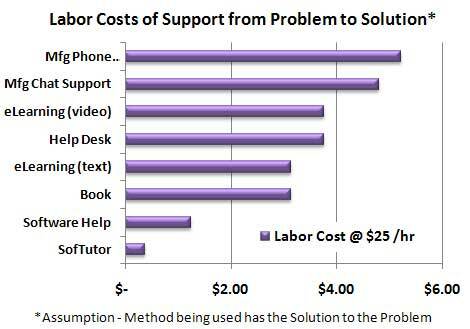 Calculations Cost of training + (hours to learn x $15/hr) = your cost - $598 (SofTutor @ $298 + ( 20 hours x $15/hr)). Assumptions: Book, Other multimedia products, Junior College and Reseller Training we assume that you will only go through the information covered one time. Video tape we considered the hundreds of rewind and plays you'd need to have to learn. 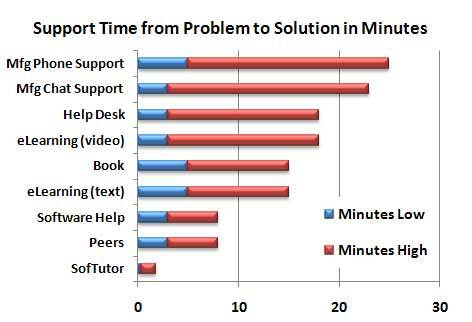 SofTutor is an excellent online Technical Support and Help System! SofTutor products also act as an online help system so that you can use it as a quick reference tool to review things that you've learned whenever you need . With SofTutor all of our video clips are indexed so you can search for any topics covered within each video and find them within 4 seconds or less. Our LAN license customers save enough time and increase each users performance that they can justify purchasing a SofTutor LAN for on-line technical support. How much would it be worth to reduce calls to your technical support staff by 70%? When users can find the questions in 4 seconds or less they increase their productivity and decrease your support cost! How much would you save? How much time a week do you spend looking up a command, or tracking down a coworker or calling the company help desk to get some answers? The following table only estimates your time savings. Calculations: (((minutes/hours) x 52 weeks a year) x $15/hr ). With SofTutor it takes 4 seconds to find what you want but we gave you 15 seconds to start SofTutor and choose the quick search feature. Find a friend we estimated 6 minutes per command. To call the help desk and get a hold of someone we estimated 1 minute.